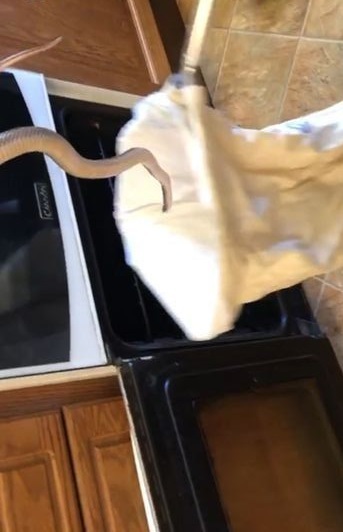 A retiree was surprised when she opened her oven and found a huge snake hiding inside. The 82-year-old was ready to cook chips for dinner when he saw the reptile and hit the door. She thought her eyes were playing tricks after having recently suffered a cataract surgery, the Manchester Evening News reports. However, an RSPCA inspector soon arrived and rescued the snake, while her wife and husband ordered from a fish shop and chip. It turned out to be a non-poisonous African-style homemade home, with a length of at least three feet. The woman had opened the oven door to burst into her chips when she saw the snake - who was later named Sammy by RSPCA - at her home in Stockport, Greater Manchester. He said: "When I opened the oven door and saw it, I received the shock of my life. "I recently did a cataract surgery and I was wondering if my eyes deceived me - but my husband also saw it. Luckily it did not harm her.